The following slides show the actual yield responses to N rate in on-farm trials for each year and by previous crop – corn or soybean. “Optimum” symbols (Δ) on each response curve are where the last amount of N just paid for itself in that trial. The MRTN symbols (ο) are at the N rate (and yield) produced by the N rate calculator version for that year for the appropriate region (north, central, south) in Illinois. We used typical corn and N prices for each year. 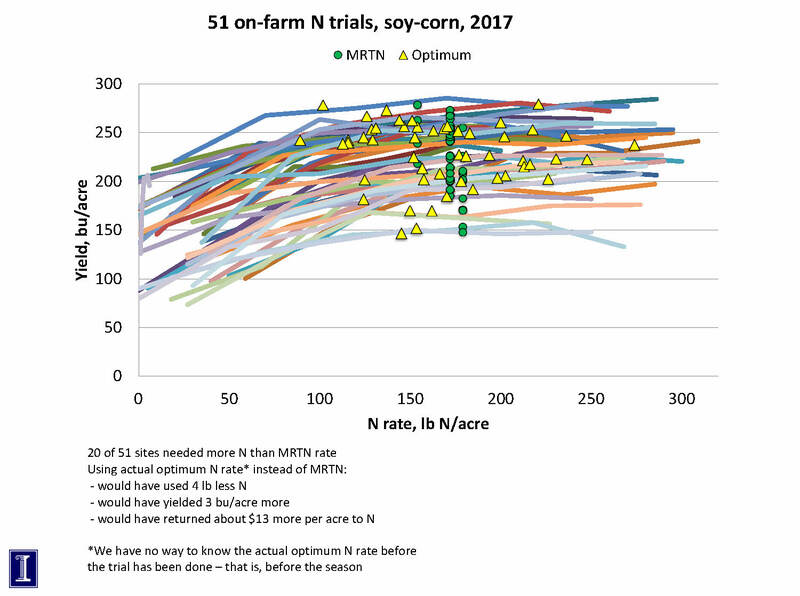 Optimum N rates from trials in years or sites with more N loss tend to be higher than MRTN rates, while in years with less N loss, optimum N rates tend to be lower than MRTN rates. The “return to N” is the price of corn times yield minus the N rate times N price. The MRTN is based on a large set of data over years, so is the “best guess” N rate. This research is funded by NREC. 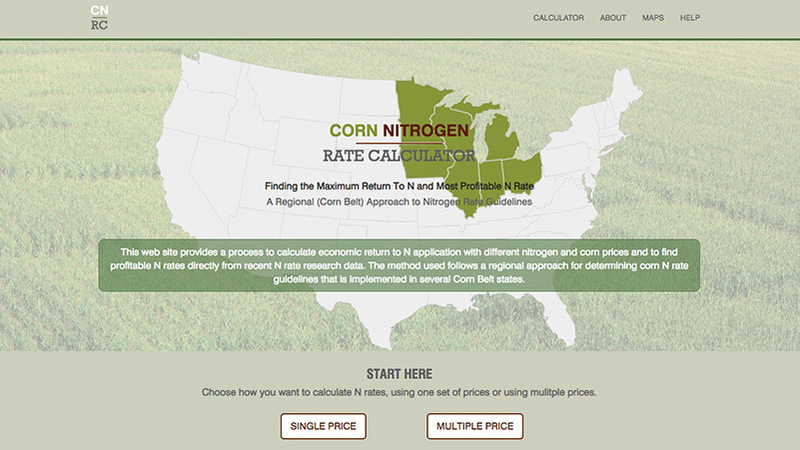 The MRNT Calculator web site provides a method to calculate the return to N application and to find the maximum return to N (MRTN) at selected prices of N and corn directly from recent research data. The MRTN approach is the regional approach suggested for developing corn N rate guidelines in individual states. Nitrogen rate trial data is provided in this web site for six states (Illinois, Iowa, Michigan, Minnesota, Ohio, and Wisconsin) where an adequate number of research trials (sites) were available for corn following soybean and corn following corn. These trials were conducted with spring, sidedress, or split preplant/sidedress applied N, and sites were not irrigated (except for those as indicated for irrigated sands in Wisconsin).